For Anti-vandal guards & glazing. Child proof screens, light-covers, safety screening & guards, Car side or rear screens. Roofing, tanks hatches, safety barriers and many other uses. Polycarbonate is a lightweight, highly unbreakable plastic found in items such as vandal and child resistant windows, machine guards, cement shuttering, sporting items and sports dug-outs and viewing screens. Safer shower screens are available with the embossed Polycarbonate. It is also used where higher temperature and fire resistance is desirable. This tough, durable, shatter-proof and heat-resistant material is ideal for a many applications. Its scratch resistance is lower than that of Acrylic as is its UV stability in standard form but new UV resistant finishes are now available. We also can supply this with a hardened outer coating to resist scratching. A small percentage yellowing after long exposure to sunlight (UV) (Far less percentage yellowing when using UV Stabilised. The edges of Polycarbonate cannot be polished very highly. At best we can scrape it to a satin finish at an extra cost. 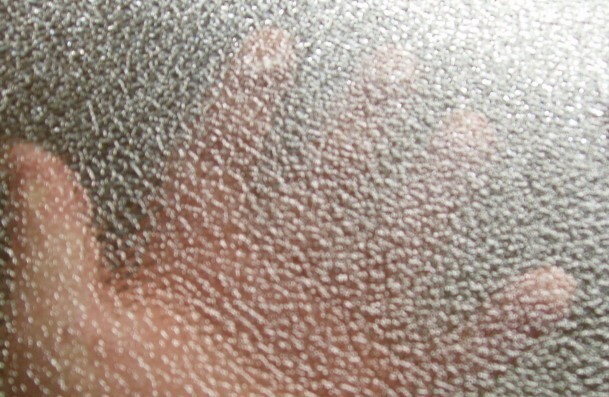 "Obscure" or "Embossed" Polycarbonate is used for shower screens & doors and where privacy glazing is needed in public areas where safety is an issue - It is almost unbreakable (unlike Acrylic) and so far safer. We show an obscured hand to indicate the degree of obscuration. This is what is typically required for shower screening. Patterns may vary from exactly that shown due to supplier variation. This data does not apply to Multiwall sheets. Please refer to our Multiwall Polycarbonate page for that information. The main Polycarbonate Solid Sheet brands we sell are Palsun®, Makrolon® and Lexan®. The data below does not apply to Multiwall sheets. Please refer to our Multiwall Polycarbonate page for that information. Polycarbonate Solid sheets are available in Clear. Some thicknesses are also available in Opal, Bronze and Obscure Embossed which is suitable for shower screens. Polycarbonate also is available with a mirror finish. If you are looking for other colours you are probably better off checking our PETG page as this material has a larger colour range and is almost as tough as Polycarbonate. Lightweight, fire resistance, safety screens, safety guards, cement, anti-vandal screens, anti-vandal windows, child proof glazing, child proof windows, car windows, car panels, sporting goods, safety barriers, viewing panels, electronics panels, food storage shelves, engineering panels, boat screens, scratch resistant plastic, UV stability.